All it takes is one person to change things. In much of history, we look at one person and one moment that is the pivotal symbol of dynamic change. In reality, there often is one person, but then there are many that follow to push the tide of change forward. Having not lived most of my life near the Great Lakes, there’s not much exposure to the surfing community around here. My perception of it was that it’s a pretty open sport given the air of counter-culture that surrounds it. However, that isn’t quite correct. Having seen Out in the Line-Up, it seems that surfing is following the same trajectory as many other sports, but may be lagging a bit behind. Like many sports, surfing has been a macho display of manhood that doesn’t exactly promote diversity. When someone breaks the mold other people can react badly, and that has happened to many people who have attempted to come out within a professional sport dynamic. They can be shunned by their peers as well as sponsors which is how many of them make a living. 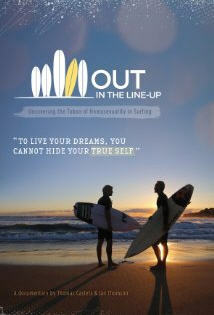 In Out in the Line-Up we see how this has affected the lives of those who are interviewed. They have had to remain hidden with the fear of rejection, isolation, and their world crashing down on them if they are found out. Some though have connected with other LGBT surfers through one man’s efforts in the form of gaysurfers.net. The process we’re seeing in this documentary is not necessarily unique, but it’s important. We’ve seen many other mainstream subsets of community further divide into subsets that are accepting of LGBT people. (I’m thinking of the LGBT Rodeo) But I think the aspect of this that brings about change is how this affects people, how it empowers and emboldens them, and the mainstream changes that we see coming from people who just want to be themselves. I like the fact that many of the LGBT surfers in this documentary found themselves and their voice in the process of changing the sport bit by bit. In one of the interviews, someone mentions that queer culture encourages you to be who and what you want to be no matter what others may say. I think it also can be a catalyst for us to grow as human beings, to step out of our comfort zone, and to bring positive change. I believe this documentary is a solid example of that concept in action. It has been changing our world for decades, and I’m glad to see that for many it still does. More info about gay surfers at gaysurfers.net.